Today I went to the (very) small and (very) quaint DMV here in Manteo to get the address on my Driver's License changed. I've gone through this scintillating process in large cities in the past and remember very well the whole rigmarole of signing in, standing in line, sitting and waiting, filling out forms, and standing and waiting some more. I walked in. I was called back. I sat down. I was back out the door in 5.7 minutes. After I had been seated at the Official Address Changing Desk, I handed the lady my old license and answered a few questions. She typed everything up and then said, "Okay. That will be ten dollars." I got out my checkbook and wrote out the check. I handed the check to the lady. And then (out of habit) I came this close to saying, "Do you need to see my driver's license?" I am so very, very glad that I clamped my mouth shut at the very last nanosecond and did not ask the Driver's License lady if she wanted to see my Driver's License. Would that have been embarrassing or what? I just received an e-mail from the Official Pastor Person in my life who just happens to be my own Personal Husband Person. He had sent out an e-mail to me and the other staff staff members at our church. 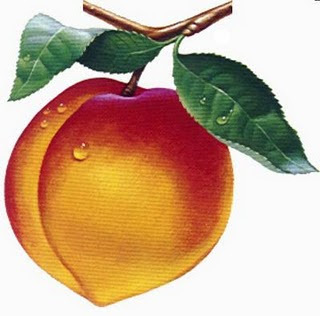 Well, it was no biggie until I got to the end of the letter and saw, to my great amusement, that he had inadvertently signed the letter, "Grace and Peach." I know he was going for "Grace and Peace," but I really sorta like Grace and Peach. It sounds a little bit like a female folk duo from the 60's! Okay, I'm signing off now. And as I do, my sincere hope is that the rest of your day will be filled with grace. Grace and Peach! hahaha I love it! Grace and Peach! I love it! That's great. I just love reading your blog- I always feel so encouraged by it! A while back I left a comment on your blog telling you about how I'm adopting a little 9 year old girl.You replied back with some very kind and encouraging words- and asked me to keep you posted about the adoption. I am a strong advocate of peaches. Also of grace, but I don't think that was the part that was in question here. In short, peaches are good and should therefore be eaten in quantity. I'm extremely jealous of your DMV, though; our nearest one (in addition to being fifteen miles away - fifteen miles that somehow turn into an hour-long bus trip) is so terrifying that I haven't even dared to go and attempt the licence procedure yet. The last colleague who went was away for an entire day and achieved nothing. You have many reasons to love your new little town, and I assure you that your DMV should be one of them. Love the PEACH! I once wrote (and MAILED) a business letter in which the last line said, "I'm sorry for any convenience this may have caused you." I didn't even notice it until I went to file my copy. How embarrassing!